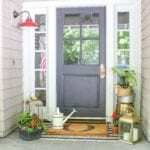 Spring is here and it’s time to freshen up your front porch! I have updated my entryway for the new season and I can’t wait to show you! My stylish front porch incorporates my favorite trends from my career in fashion, all while keeping it simple too! If you’re new here, welcome! I’m Ashley, wife and mom of two. 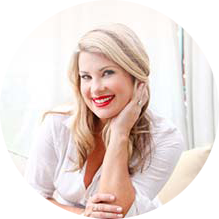 We live in the San Francisco Bay area where I own a women’s clothing and home accessory store, Flaunt Boutique. I have owned my business for 16 years! I love fashion and more times than not, fashion influences how I decorate my home too! So, I updated my porch for spring and I can’t wait to show you all the details! 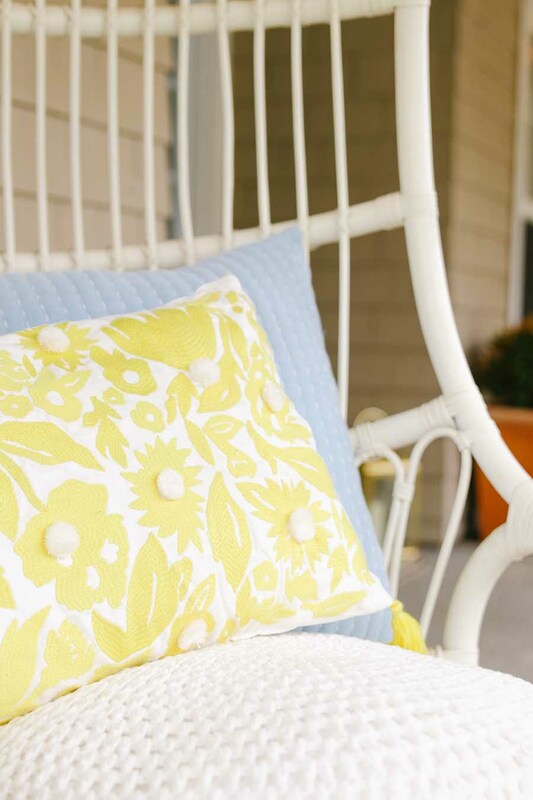 I’m part of a fun group of bloggers who are all sharing their spring porches today. 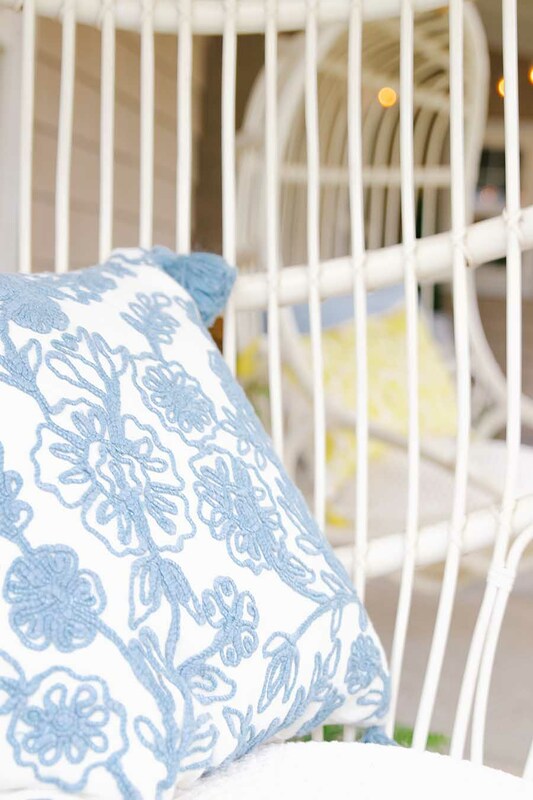 Be sure to visit all the beautiful spring porch decorating ideas at the bottom of this post! 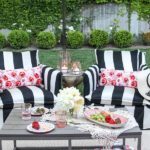 When I started to think about how I wanted to decorate my front porch for spring, I thought about the biggest trends that I am seeing in fashion for spring. Beautiful floral prints, classic stripes and YELLOW are all very big trends in fashion right now. My Spring Hoop Wreath with lemons showcases a sampling of these fashion trends pretty beautifully. And it was a great jumping off point for the rest of my spring front porch! 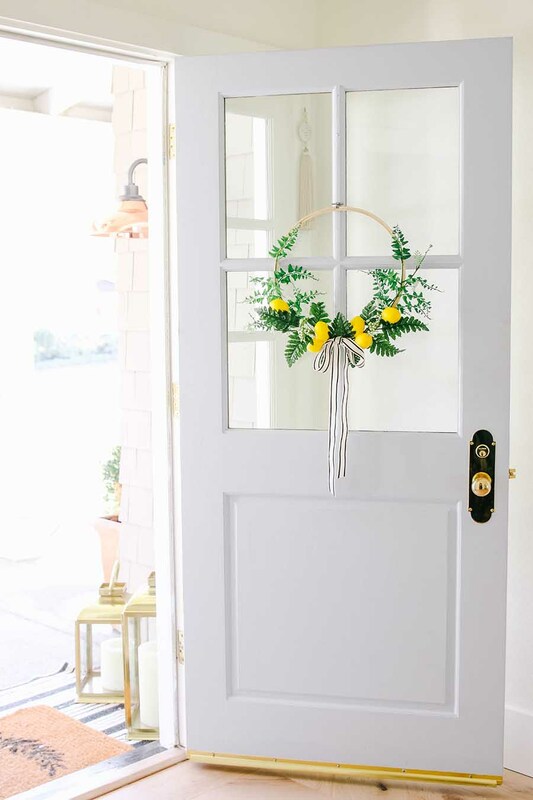 With this pretty lemon hoop wreath, all that was needed to complete the front door decorations were a few fresh flowers. I picked up some fresh daffodils and lilacs at Trader Joes. I love multi-tasking and being able to get fresh potted flowers at the grocery store! 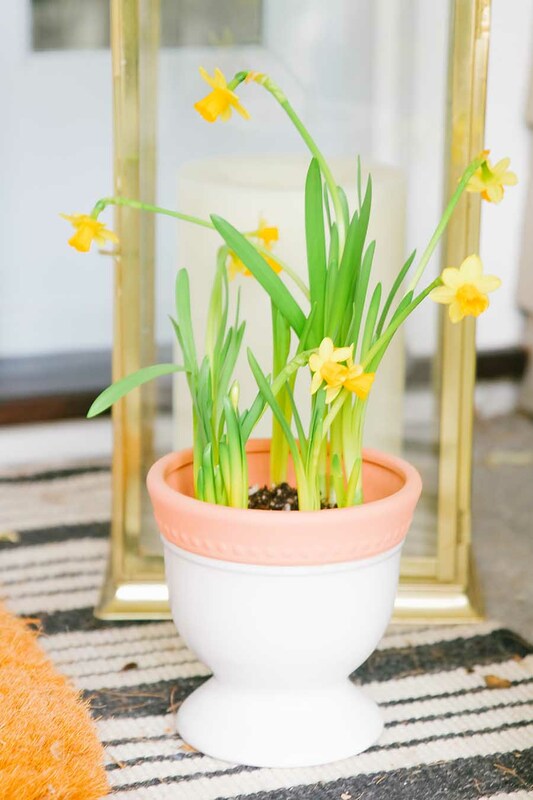 These daffodils just make you instantly happy, don’t you think? Nothing says spring more than these cuties. 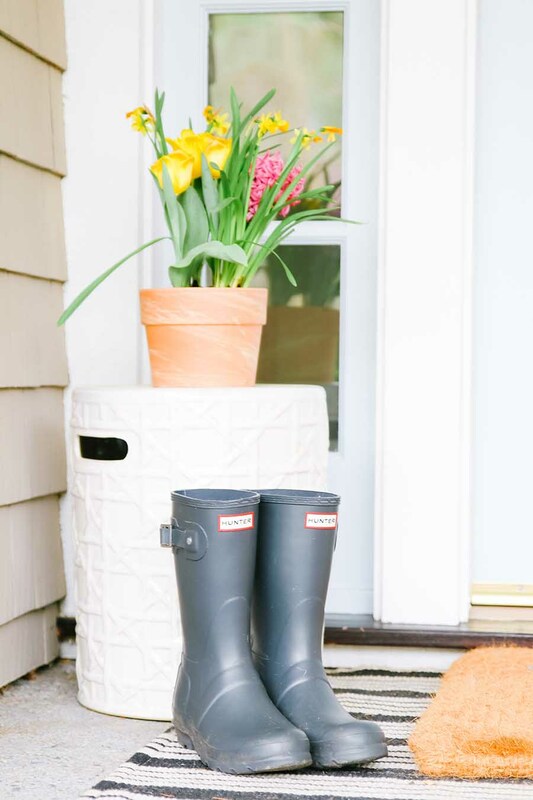 And it has been raining non-stop, so my rain boots have been a permanent fixture at our front door. But, you know what they say. April showers, bring May flowers. But it’s only March – insert crying emoji! 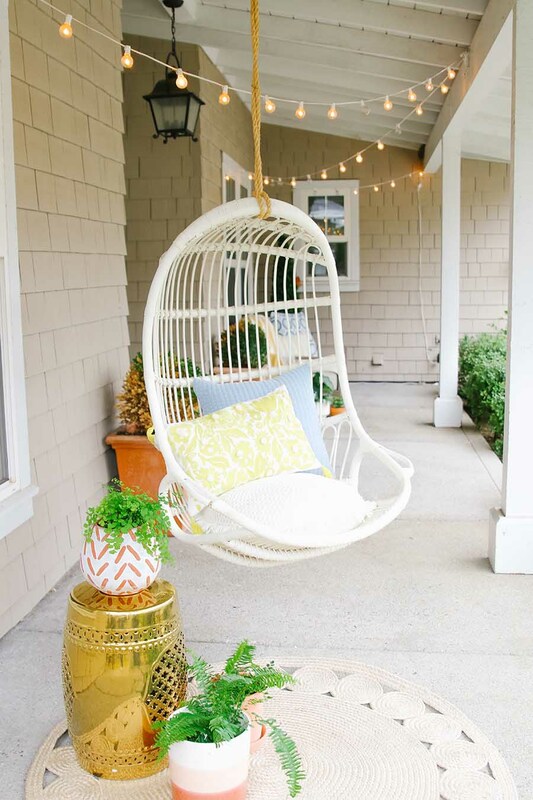 Our favorite spot to sit during the warmer months is on our front porch on our hanging chairs. We seriously use these chairs all year long, but once spring hits, this is our go-to spot for coffee, cocktail hour and everything in-between. I wanted to bring some of that stylish vibe to this front porch sitting area. I found this super cute yellow print pillow at Target. And I love how the bright lemon yellow makes this space feel fresh for spring! And the blue matches my front door. Floral print is such a big trend in fashion for spring. I also love the tassel detail on these pillows. 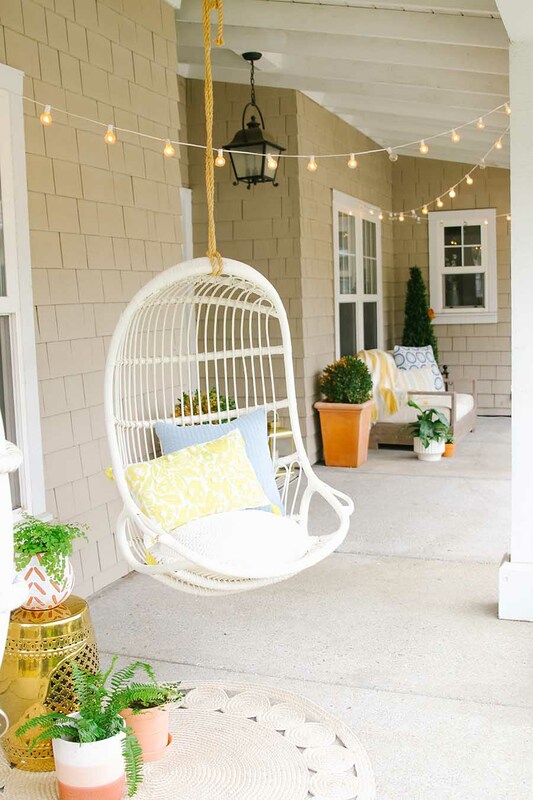 It brings a little boho flair to this simple spring porch. One of my favorite things about the warmer weather is being able to bring the twinkle lights back out! We have these cafe lights hung year round. But in the spring and summer we really get to enjoy them because we are outside more. I just can’t let go of that magical twinkle light glow after the holidays. And it’s a great way to add ambiance and character to the front of your home. I’m so excited because our roses are just about to start blooming! It really is quite the sight every year when they burst with their beautiful blossoms. I take extra care with them throughout the year and I have shared my secrets with you – check out my How To Care For Roses In The Winter to see my tips and tricks. Ok, back to my simple but stylish front porch for this spring. There are lots of things that we love about our home. But one of my favorites is the front porch. We spend time every day sitting out here on the swings and visiting with our neighbors. It is the perfect spot to watch the kids play and also a good place to enjoy a glass of wine after the kids are in bed. And I brought some of my indoor plants out front to get a little vitamin D! The weather has been so mild lately with lots of rain, so they are really loving it. And I really like how the plants add a more inviting feeling to this porch. It’s almost like creating an extension of our home outside. Our family really enjoys being outdoors when the weather is mild, so creating a living space outside is important for us. Yellow, floral print and some stylish boho vibes have been a bit influence on my spring front porch style this year. And I definitely see those trends in fashion too. So, even if you aren’t brave enough to wear a bold floral print, your home can rock that print loud and proud! 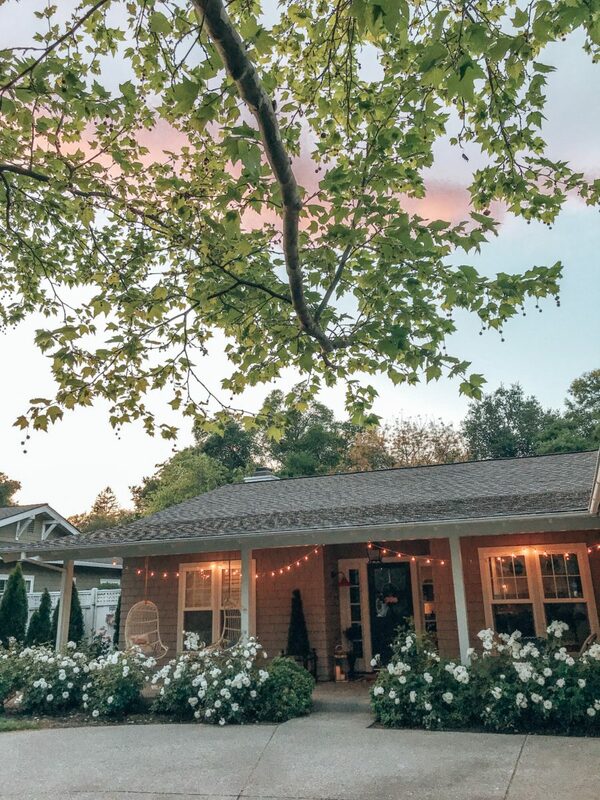 I hope you enjoyed seeing a little glimpse of my spring home with this stylish front porch tour! 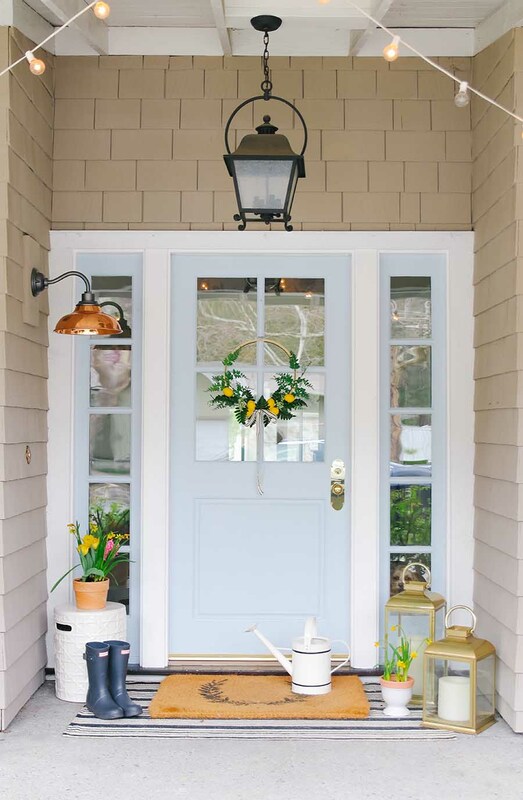 Be sure and visit my friends linked below for more spring front porch inspiration! It’s gorgeous, Ashley!! I love your big beautiful wide porch – and your spring touches are fabulous. I didn’t know you had a previous career in fashion – no wonder you are so on trend and have amazing home style, as well! Ashley you always impress me! This is stunning! 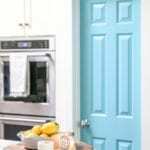 I love your door color. 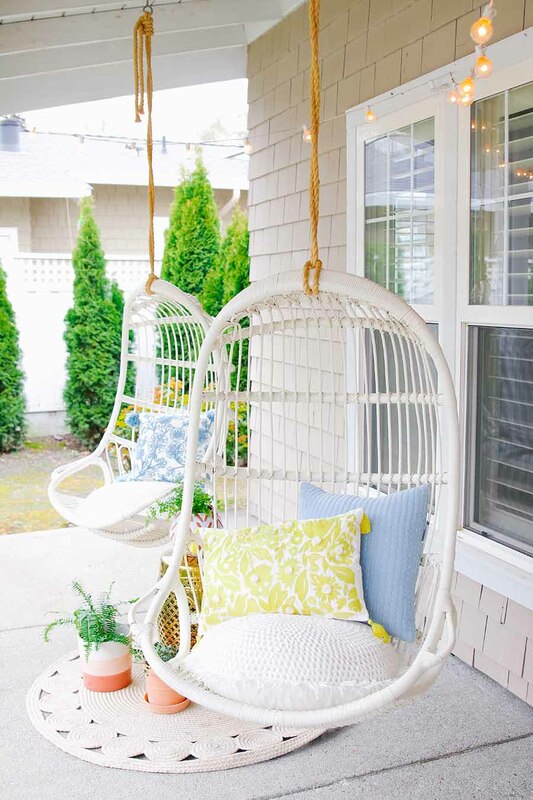 Love your fabulous porch and those chair swings are so fun. Everything looks so inviting. The blue and yellow is so fresh for Spring! Love it! Thank you! I love that combination too. 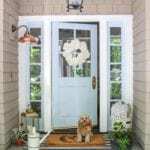 Ashley, your door color is so pretty as is your gorgeous porch! You did such a beautiful job with all your spring touches! Wow, I’m head over hills for every part of your spring porch! The boho details are stunning and that lemon wreath is gorgeous. 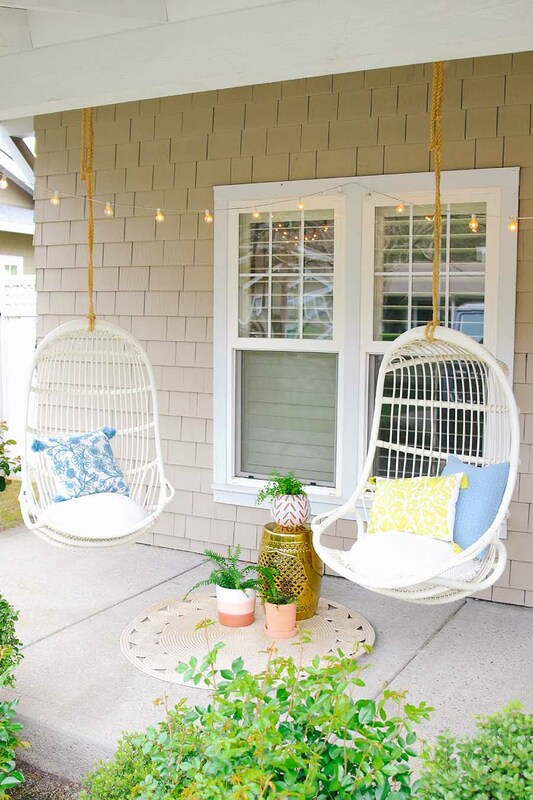 They make your porch look so cozy, bright and inviting. I can already picture myself sitting all day and night in these comfortable chairs. Love your style so much!